Cella (or naos)- the main chamber of a Greek or Roman temple, built to house the cult statue. Peristyle- the colonnade around a peripteral building or around a court. Peripteral- a adjective describing a building with a colonnade around its entire perimeter. Intercolumniation- the space between two adjacent columns. Stereobate- a solid mass of masonry serving as the visible base of a building, especially a Greek temple. In a Greek temple only the lower steps are called the stereobate; the top step, on which the columns rest, is called the stylobate. Entasis- the swelling convex curvature along the line of taper of classical columns. The entasis of early Greek Doric columns is pronounced, but becomes ever more subtle until, in the columns of the Parthenon, it is barely perceptible. 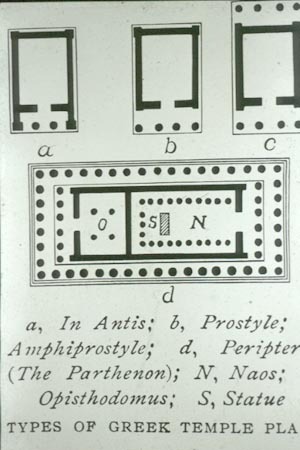 Echinus- in the Doric order, the quarter round molding beneath the abacus of a capital. Abacus- the uppermost part of a capital, forming a slab upon which the architrave rests. Entablature- the group of horizontal member resting on the columns of the one of the classical orders. It is divided into three parts: architrave, frieze, and cornice. Architrave- the lowest member of an entablature, resting directly on the columns. Frieze- the middle member of an entablature, between the architrave and cornice. Triglyph- in the frieze of the entablature of the Doric order, the vertical blocks, which are divided by channels into three sections. Originally, the triglyphs were probably the ends of wooden ceiling beams. Metope- in the frieze of an entablature of the Doric order, one of the panels between the triglyphs, sometimes ornamented. Originally, in wooden temple, the metopes may have been openings between the ceiling beams. Cornice- the topmost part of a classical entablature. Pediment- in classical architecture, the low-pitched gable, or triangular area formed by the two slopes of the low-pitched roof of a temple, framed by the horizontal and raking cornices and sometimes filled with sculpture. 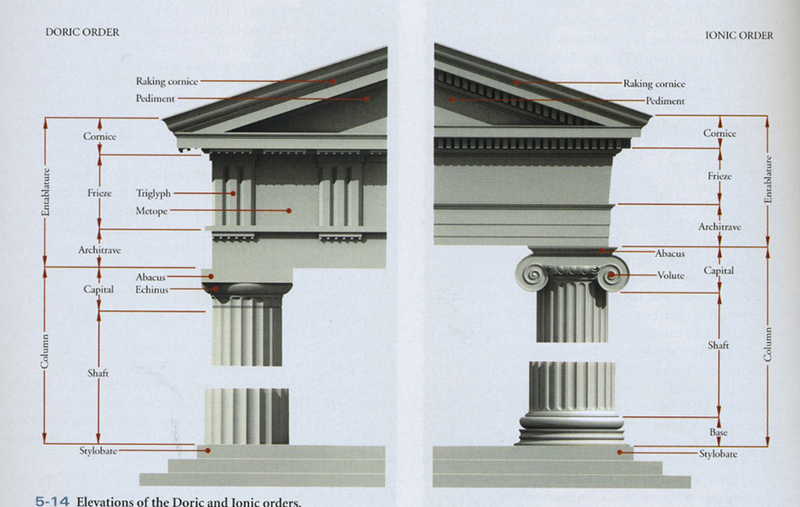 Orders- an architectural "order" is one of the classical systems of carefully proportioned and interdependent parts which include column and entablature. Doric- the oldest, studiest, and most severe of the orders. It developed on the mainland of Greece. The most distinguishing characteristic is probably its capital, but note the absence of a column base and the introduction of triglyphs and metopes in the frieze course. Ionic- is more slender and lighter than the Doric. The Ionic developed in the lands east of the Aegean and was more subject to the influence of older Asiatic styles. It is quickly distinguished by the volutes of its capitals. Note the presence of a column base and the absence of the triglyphs and metopes. Corinthian- developed later than the Doric or Ionic. It is distinguished from the Ionic by its capital formed of a circular belle of rows of acanthus leaves. Megaron- a large oblong hall in an Minoan or Mycenaean palace.